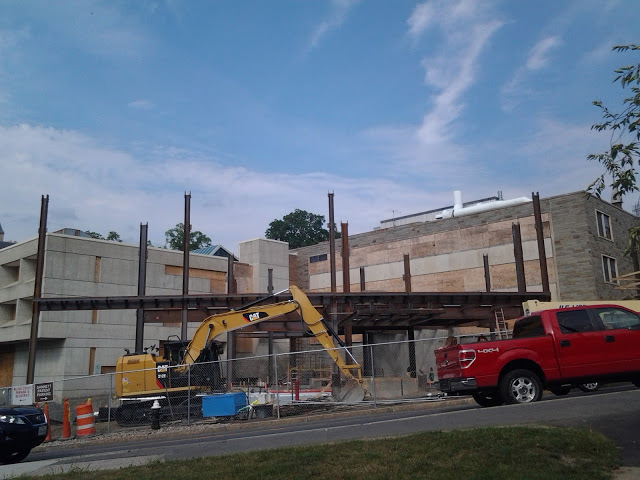 It wouldn’t be Cornell if they didn’t have at least a few construction projects underway on their campus, and this summer has been no exception. 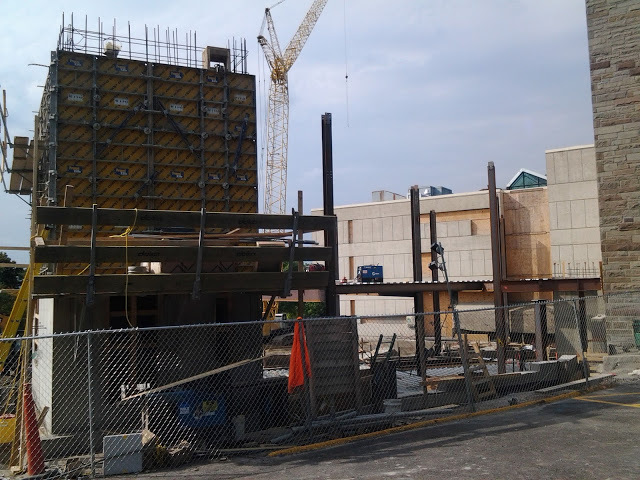 Here are some photos of the Gannett Health Center expansion taken last weekend. 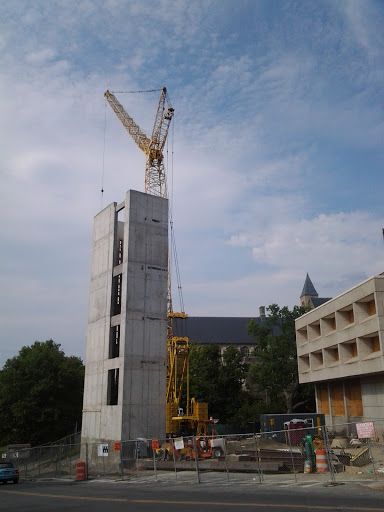 The poured concrete stairwells are probably the first thing passersby notice, given that they’re the tallest structures on-site (construction cranes notwithstanding). 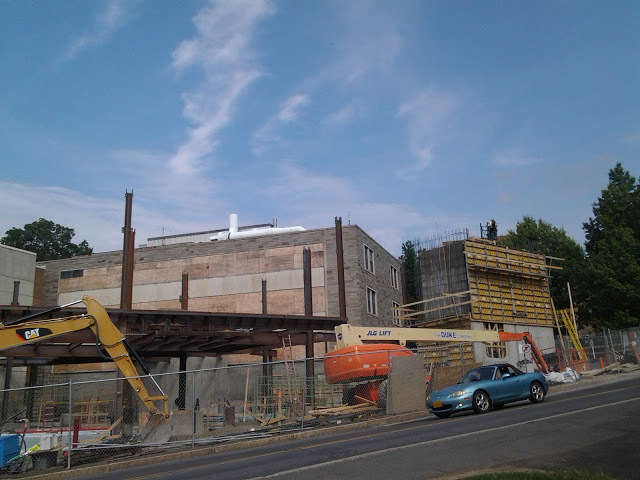 The western stairwell has been fully poured and topped out, while the eastern stairwell is currently underway. Look closely and you’ll see the wooden forms used on the concrete. These forms provide stability and shape while the concrete hardens, and they provide support to the reinforcing rods embedded in the concrete. They will move further up the stairwell as more concrete is poured and cured. 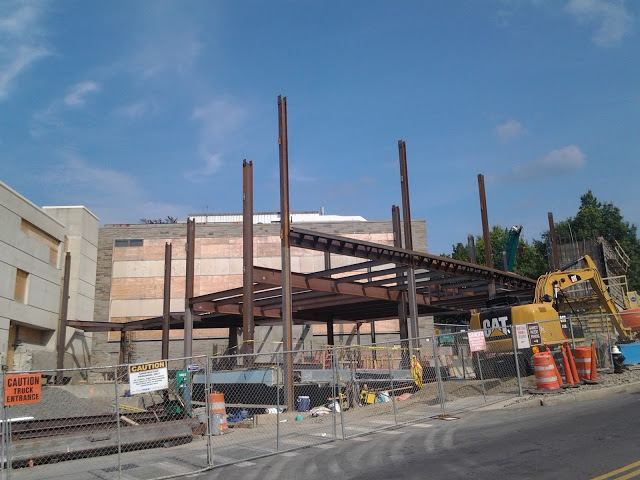 Between the stairwells, structural steel beams and joists are being hoisted by crane into plane, and corrugated steel decking for the floors is being laid down as the steel framing is built out. The new addition will continue to rise as the new building, the first phase of three, moves towards its July 2016 completion. 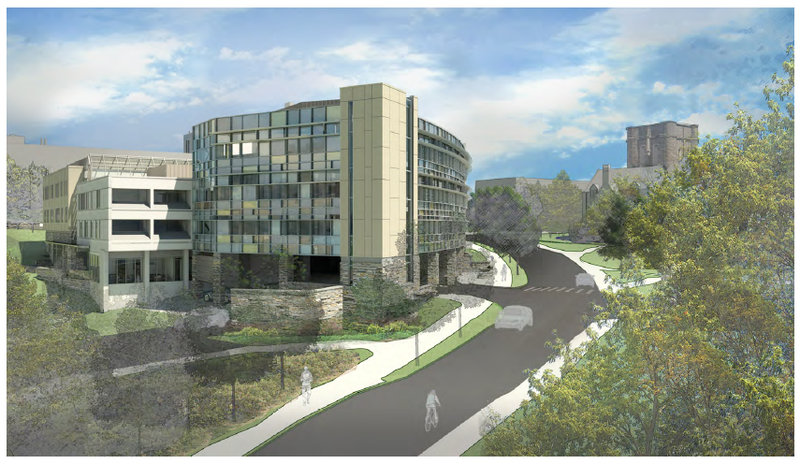 Phase II focuses on renovations to the old building, and Phase III a reconstructed Ho Plaza entrance. The whole project is anticipated to be completed by August 2017. Construction firm Welliver is the general contractor for the project. The building design is by local architecture firm Chiang O’Brien, with landscaping by Trowbridge Wolf Michaels Landscape Architects. There will be two additions to Gannett, a four-story, 55,000 square-foot building, and an additional 18,600 square foot addition that replaces the northeast side of the current building. The project also includes a new entrance and substantial renovations to the original 1956 structure (22,400 square feet of the existing 35,000), as well as landscaping, site amenities, and utilities improvements. The projected cost is $55 million. Short set this week. Things are relatively quiet for this week’s round-up. 1. 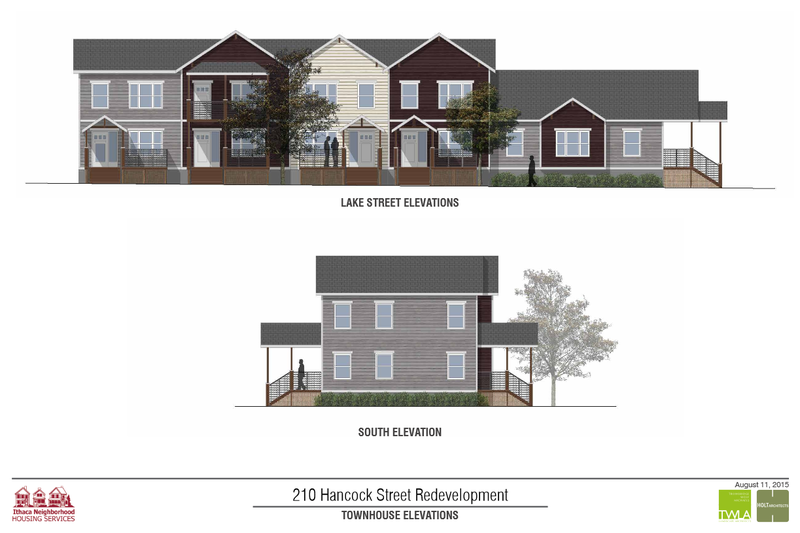 Leading off this week, Ithaca Neighborhood Housing Services’ (INHS) 210 Hancock development has finally received initial approvals, after a months-long, contentious debate. With the zoning variances granted, it was up to the planning board to issue preliminary approval, and compared to previous meetings, the discussion and decision was brief and uncontested. The plan is to have the project start construction in its phase (the commercial space, 53 apartments and the five rental townhouses) next May, wrapping up the following year. Initially, the time-frame was next fall, but getting approvals now has allowed INHS to move up the time-frame a few months. The seven for-sale townhouses will be built at a later date, with funding separate from the rental units. The project isn’t necessarily a 100% sealed deal (and really, no project is until it’s complete). INHS has to submit an application for low-income tax credits as part of its financing package, and those are due in by October 6th. Only about 30% of applications receive funding (recipients will be announced in January 2016), but INHS has a pretty strong track record to go on. 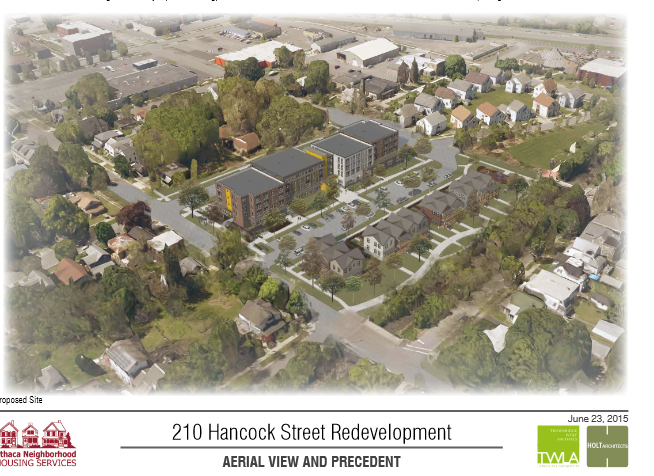 After the feud over the Stone Quarry Apartments, INHS made an effort to be transparent about the planning process with the Hancock project and openly engage with the community. Unfortunately, it backfired. 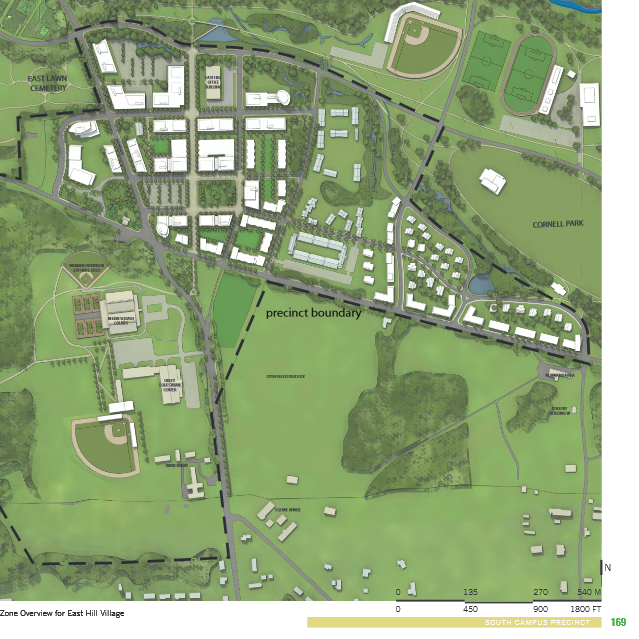 It’s looking like INHS’s next major proposal will end up out in Freeville, so apart from one or two houses that may end up in the pipeline over the next year or so, INHS isn’t likely to propose any further affordable housing development in Ithaca for a while. 2. One controversy subsides, another heats up. The Planning Board was not amused with State Street Triangle at the latest meeting. Now, given the wide spectrum of opinions that runs through the area, the folks that serve on the board tend to be fair and even-keeled. Not gung-ho about all projects, but definitely not a part of the “I oppose anything that makes Ithaca look different” commentary that comes out of some quarters. So this week’s comments tend to be about as harsh as it gets without saying no outright. I personally don’t like the “It doesn’t look like Ithaca” comment used for the Ithaca Voice headline, because a city isn’t a static object – buildings are built or replaced, homes are painted and renovated, and retailers change. The Ithaca of 50 years ago, or even 20 years ago, isn’t like the Ithaca of today or 20 years from now. Subjective comments are prone to pitfalls. But that doesn’t change the fact that the size of this proposal makes a lot of people uncomfortable. The building can be built as-of-right (but board approval is still required before permits can be issued), but there might be a substantial benefit if Campus Advantage were accommodating of the concerns, especially with the tax abatement being pursued. For the sake of example, INHS was very receptive to incorporating suggestions in its 210 Hancock project, which really helped during the approvals process. A little more flexibility on CA’s part could make all the difference, assuming they can still make a decent return on investment. I’ve heard that there are further design revisions underway (whether they’re minor tweaks or major changes is not clear), and hopefully those will be put forth for review sometime soon. “Cornell is moving on its consultant to plan the first phase of redevelopment of the East Hill area”. The wording is a little odd, but my impression is that the consultant is moving forward with planning the first phase of the “East Hill Village“, or whatever Cornell’s planning staff are calling it these days. Actual plans are probably still several months or a year out, not to mention the months of trying to get approval, and then financing/construction. But given the rapid rise in enrollment at the university, any movement towards accommodating more students and reducing the strain on municipalities is welcome. 4. 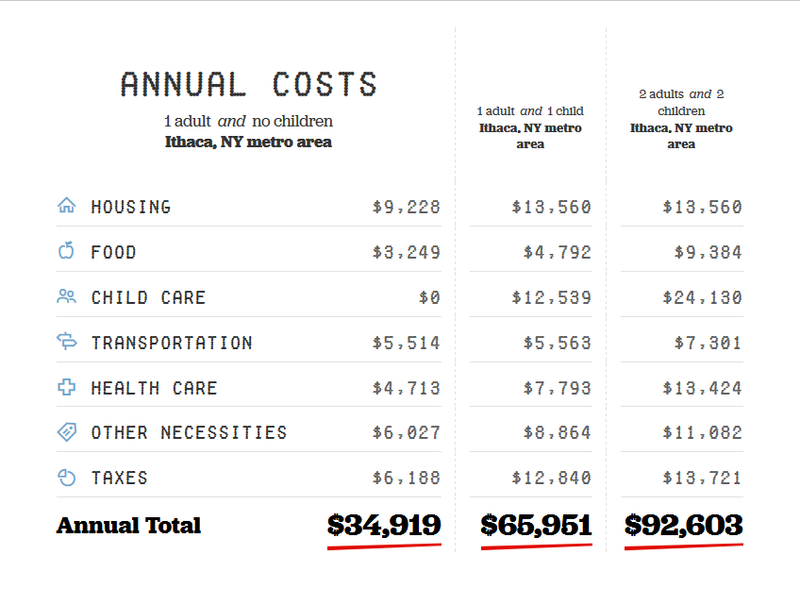 There will be a full-fledged article on this in the Voice next week, but for those looking to kill time, here’s a “family budget calculator” from the Economic Policy Institute think-tank. There are several ways to calculate affordable housing, but many don’t take childcare into account, so it’s worth seeing just how much affordability changes when children enter the picture. Word to the wise though – EPI’s data has some flaws. If you compare this to AFCU’s living wage calculation for adults with and without children, you’ll find some sizable differences. Most of the time, writing up initial project pages is mostly background details, along with whatever scant details were included in the sketch plan. It usually makes for an exciting post, though occasionally lacking in details. Now here we have the total opposite – a project where many of the details have already been gone over with a fine-toothed comb. 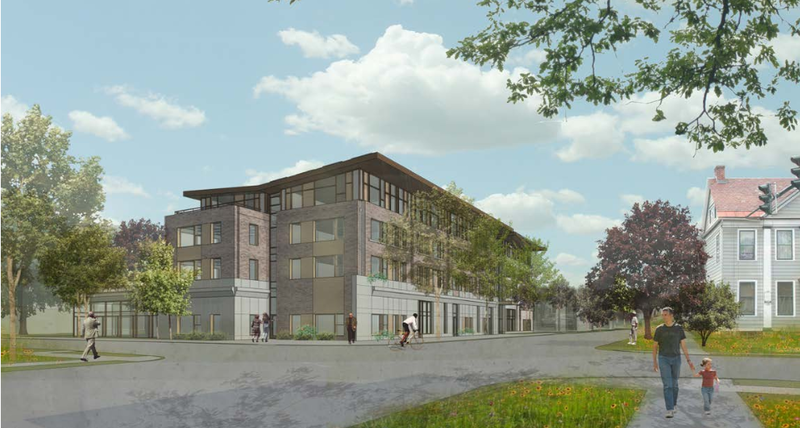 Here we have the county legislature’s preferred development for the Old Library site at 310 North Cayuga Street, the DeWitt House Senior Apartments. It has a website, a completed Site Plan Review (SPR) application (here), and the county is heavily involved with the approvals process. I’m not going into the debate between this and the Franklin proposal with this piece. It’s intended more as a project summary. Plans call for a mixed-use, 4-story, 72,500 SF building. On the upper three floors are 39 1-bedroom and 21 2 -bedroom apartments aiming for the middle of the rental market, and serving renters aged 50 and older. Approximately 40 parking spaces will be provided, as well as CarShare and a shuttle. 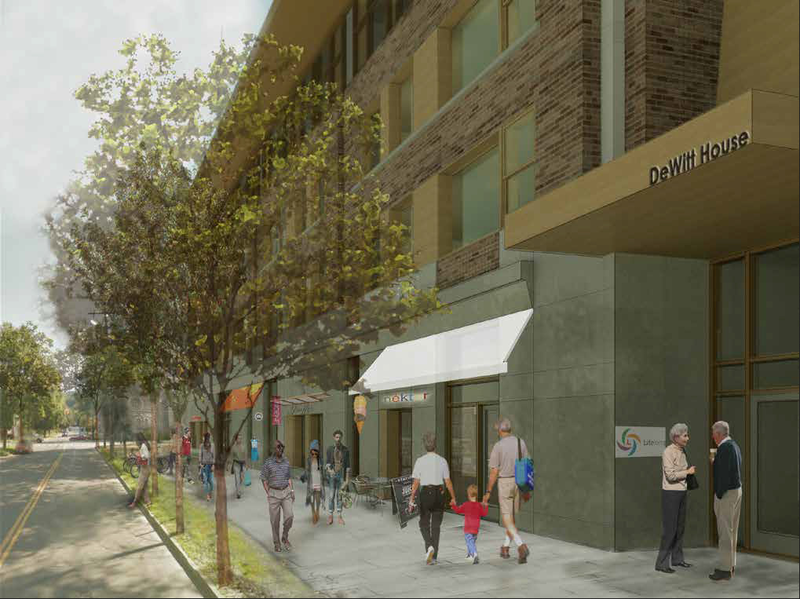 Along with the apartments, there will be community space on the southeast corner of the first floor (2,000 SF), new digs for senior services non-profit Lifelong on the west side (6,500 SF), and office/retail space facing Court Street (4,000 SF). The building will deconstruct the old library, and there are plans to reuse much of the foundation, steel, and possibly the brick from the 1967 structure. The one-story Lifelong building at 119 West Court Street, which dates from the 1950s, would also be taken down. The Lifelong annex building at 121 West Court Street, which dates from the late 1800s, would be renovated into a guest house for those visiting friends and family living in the apartments. HOLT Architects, which is among a few local firms to have accepted the Architecture 2030 Challenge, has designed the building to be carbon-neutral. Solar panels, rainwater collection from the roof, and a Combined Heat and Power system (CHP) are some of the green features. The project is being developer by local developer Travis Hyde Properties, and the design is the work of local design firm HOLT Architects. Contact info for both is provided here. TWMLA Landscape Architects, Esther Greenhouse, T.G. Miller Surveyors & Civil Engineers, Elwyn & Palmer Structural Engineers, and Delta Engineering are also providing services. The SPR application indicates that the $14,000,000 building is aiming to launch construction in June 2016, and finishing up 12 months later. However, the timeline in the SPR says construction wouldn’t start until February or March of 2017, with completion in summer 2018. 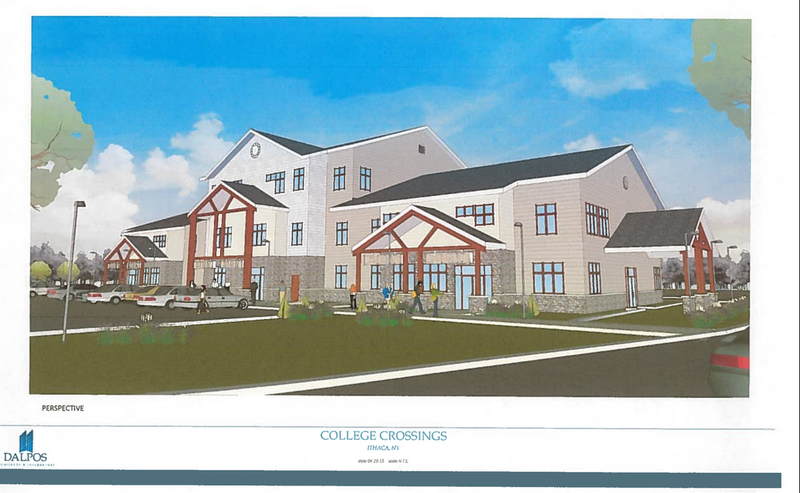 The renovation of the Lifelong Annex would be completed by the end of 2018. The DeWitt House project will need not only approvals from the city Planning and Development Board, but also the Ithaca Landmarks Preservation Council (ILPC), since the land is a part of the DeWitt Park Historic District. I. The primary component is that CA is negotiating a deal for 250 parking spaces in the upper levels of the Cayuga Street garage. The document notes an average surplus of 300 parking spaces per day. II. The city is willing to let CA reserve up to 100 parking spaces in the Seneca Street garage. III. CA has identified 75 underused spaces in the Green Street garage, but no formal deal is planned yet. IV. Surface parking lots near Cornell and in other parts of the city that could handle parking for those who only need vehicles on weekends or for holiday trips. Given typical student vehicle ownership rates of about 27% (27% of 620 = 167 spaces), point I will probably be enough to handle resident traffic. Commercial traffic, estimated to be about 64 spaces in the SRF Associates traffic study, would more likely be taken care of by point II or III. So the parking situation appears to be better thought out at this point. CA is also planning a bike share and an Ithaca carshare location. Whether it’s enough to please city staff, we’ll see. The revised document notes construction traffic would enter the site from E. Green Street, and exit via Seneca Way and East Seneca Street. 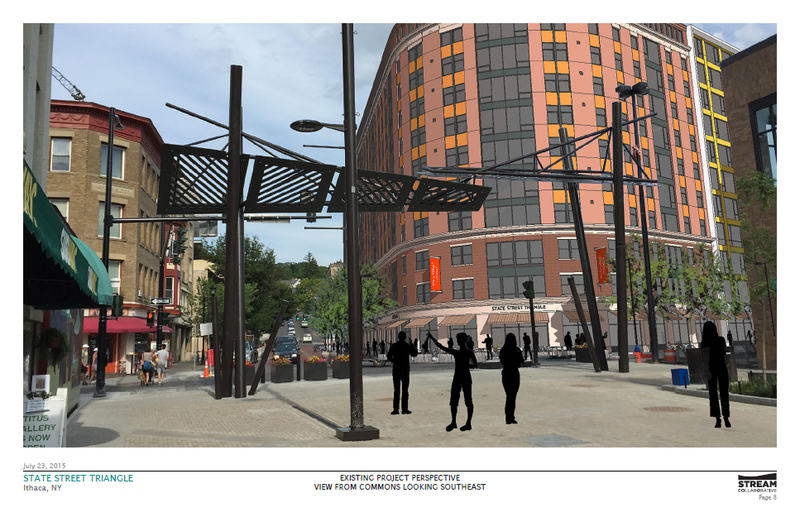 State Street Triangle will be undergoing a public hearing at Tuesday’s city Planning Board meeting, and the committee will be going over the project’s City Environmental Quality Review forms. CEQR is the city’s more stringent version of SEQR, and is used to assess project impacts – basically, mitigating the issues created by the project, and making sure it’s a net positive for the community. No voting is expected. State Street Triangle has also applied for CIITAP tax abatements, but the IDA meeting has yet to be scheduled. 2. Quick update on 406/408 Stewart – a copy of the Ithaca Landmarks Preservation Council (ILPC) from last month indicates that council members are across the spectrum when it comes to 408 Stewart (bluish-white building above) still being historic, and if a new apartment building will be built on just the site of 406 Stewart (red building, destroyed by the Chapter House fire), or on the site of both 406 and 408. Members had to stress to themselves to look at historic value and reconstruction separately, and the purpose of the site visit was to help figure out a decision. There’s been no news yet, but we’ll see what happens. 3. Over in the village of Groton, a small development project is stirring debate of its own. 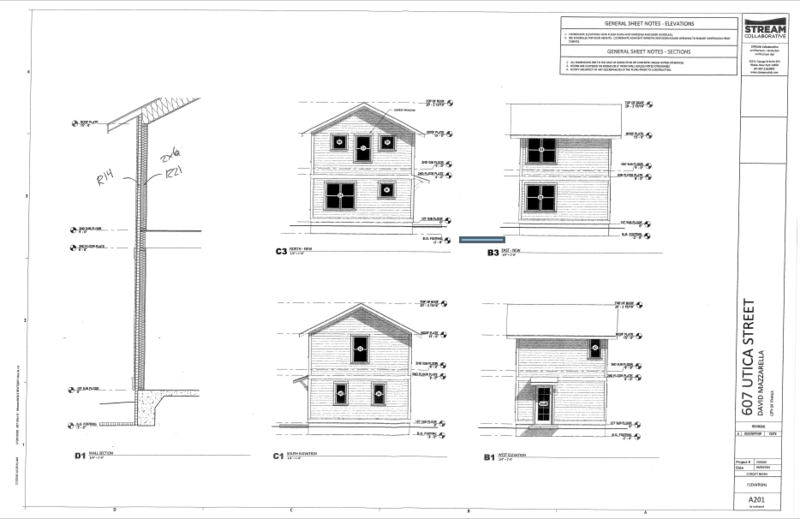 The project, proposed by Rick Uhl of Genoa, calls for four duplexes and four single-family homes, for twelve units total. The temptation is there to approach this with urban condescension, but for Groton, population 2,400, it’s a big deal. The homes would be built on several already-subdivided lots on a new road coming off of Elm Street on the eastern boundary of the village. The original plan called for duplexes on the west side of the street and closer to the village center, while single-family homes would be built on the lots on the east side of the street. The debate lies with proposed zoning changes in Groton – a zoning change currently being considered by the village would downzone parts of the town to single-family homes only. That includes the lots the duplexes are slated for. The zoning has been a source of debate among homeowners in Groton, because a number of them own larger homes that they’ve turned into duplexes, living in one unit and renting out the other. Although the law grandfathers in current buildings, they worry it could be a hassle in the future. The county’s planning department has also expressed issues with the plan, saying that it creates numerous non-conforming lots and that it goes against the county’s comprehensive plan. A compromise had been reached between the developer and planning board last spring, where duplexes would be built on the new street’s east side and single-family homes on the west side (so as to keep apartment dwellers from mixing with family homes), but more recently the village has made moves toward an all single-family plan anyway, which is creating some consternation since it tosses the compromise out the figurative window. The Times notes that a decision on the zoning, and the compromise by extension, is expected at the September meeting of Groton village’s Board of Trustees. 4. Looks like there’s going to be a lull in activity in the town of Ithaca for the next few weeks. The Planning Board meeting for the start of September has been cancelled. The Planning Committee, which is comprised of the town board members and planning department staff, will be discussing a “family entertainment facility concept” for the intersection of Elmira Road and Seven Mile Drive, and modifications to the Planned Development Zone for the South Hill Business Campus (SHBC), an industrial and office park that reuses the old NCR headquarters. A quick email with SHBC manager Linda Luciano says that the meeting will be to expand the business types allowed under the PDZ, because they were uncertain who would be interested when they first renovated the facility, and they wish “to support a more wide array of possibilities”. No expansion plans are on the table, although rough plans have been around for a while. Readers might recall that Maguire dealership chain proposed a HQ and expanded facilities along Elmira Road and Seven Mile Drive, but the plan was dropped last December due to differences in opinion on appropriate zoning for the site. A mini-golf plan was also floated a few months ago, but later dropped from consideration. 5. Here’s something worth a short note – a vacant 2.01 acre commercial property in Dryden Village sold for $31,500 on Wednesday the 19th, well below its $150,000 assessment. The buyer is an LLC called “NBN Properties”, registered in July 2014. A separate document identifies the members of the LLC, one of whom is the president of John C. Lowery Inc., an Ithaca construction company. At a glance, this story had appeared much more interesting – the P.O. Box NBN Properties is using once belonged to Ed LaVigne, who’s running for Lansing town supervisor. But LaVigne stopped using the P.O. Box in 2014, which allowed NBN to reserve it. Regardless of who runs “NBN Properties”, the site is a potentially good location – Poet’s Landing was built just a few minutes’ walk away to the west, and the DOT has been aiming for a move next door on an adjacent 10.8 acre parcel to the north. The county has paid for a feasibility study, now underway, for moving the DOT from the city waterfront to the location off Enterprise Drive in Dryden village (costs have delayed the move for years). This part of Dryden village has seen some other new businesses in the past few years, including a microbrewery and a Dollar General. If anything interesting comes along, expect a follow-up. 6. Nothing “new new” coming up at Tuesday city Planning and Development Board meeting, but plenty to talk about. Here’s the agenda, a rundown of what to expect. The project was approved two years ago this month, but no building permits have been filed. Under that circumstance, an approval is only good for two years. The applicant is looking for a re-approval with no changes. A contractor associated with the Cornerstone Old Library proposal estimated construction on the 11-story, mixed-use project would begin this fall. 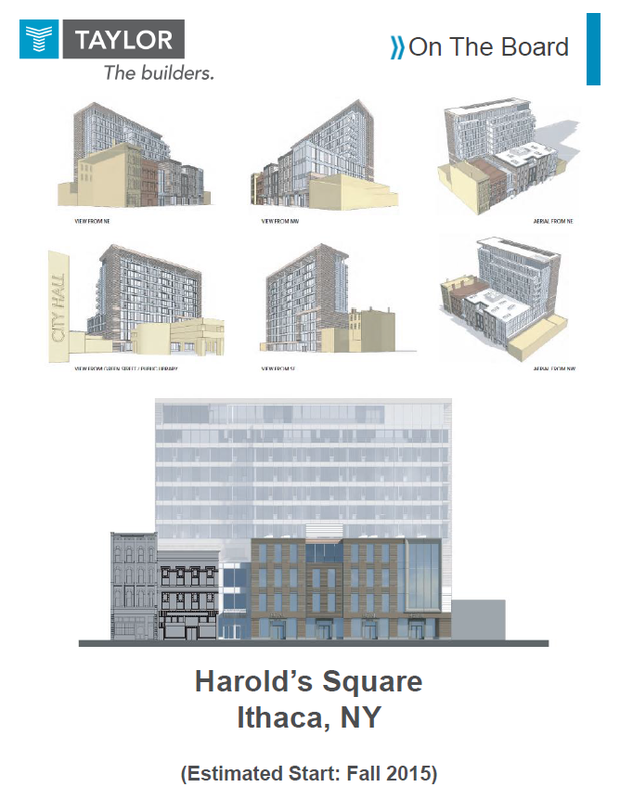 Harold’s Square developer David Lubin is seeking to bring retail, office space, and 46 apartments to the market. 6. Sketch Plan – Old Library proposal, Travis Hyde. Not exactly new, but I’ll give it the standard project summary next week. For Part I, click *here*. Once the federal funding for Project One came through in December 1964, the gears had started to turn. In Spring 1965, the president of the Hotel Ithaca bought the Clinton House for use as a temporary facility while the new hotel was built. 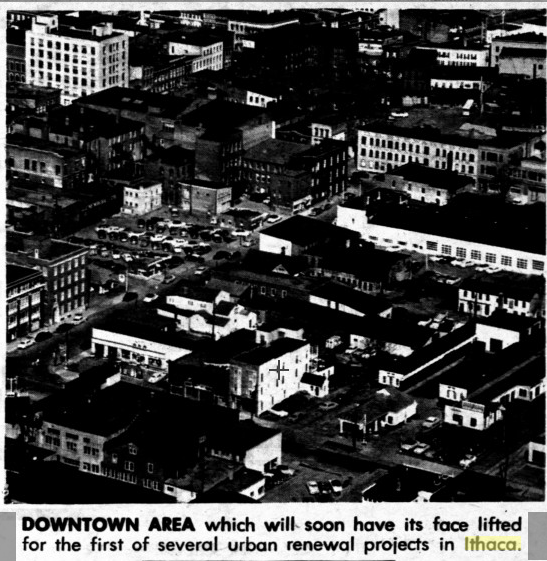 Funds and plan details were formally accepted and approved by the Feds and Common Council in May 1965, and the Ithaca Urban Renewal Agency (IURA, which still exists today) was incorporated. The IURA was long a sore spot among city councilmen because Democrats were opposed to it and Republicans were in favor of it. The city was a little less one-sided with its politics back then. In 1966, two developers were designated for two properties in the Project One area. One would build a set of retail spaces, the other would be responsible for what would be the nation’s largest Woolworth’s department store. For those too young to know, Woolworth’s was a major discount and department store chain – a sort of Walmart or Target of its day (and more like a Kmart towards the end), which was from the 1880s to 1990s. The Woolworth’s was supposed to draw people into downtown, and would be on the corner of S. Cayuga and W. Green Streets. Problems arose when Woolworth’s said it would need even more parking space than planned. The city, fearing the department store would end up in the suburbs, rushed to condemn three properties on the edge of the project area, two car dealerships and a repair shop. The buildings were demolished, acres of parking laid, and the store opened in the winter of 1968/1969. It was not an attractive building by a long-shot, but the store did draw people downtown, and it remained open until about 1998, when the entire chain went under. Today it’s the county library, and the entire block has once again been redeveloped, which was previously written about here. The closest Ithaca got to that chic modern hotel was the Ramada that opened in 1972 (later Holiday Inn, and now the Hotel Ithaca). That fell just outside the Project One boundary line. The original 1970s hotel, without the “Executive Tower” built in 1985, can be seen in the lead image. The Hotel Ithaca fell to the wrecking ball in 1967, around the same time that the 2, 4 and 5-story buildings across the street from the Carey and CSMA also came tumbling down. Until the Marriott currently under construction, the city struggled to find a developer interested in the site; the site was developed in 1975 into the new Rothschild’s Building, but the older 1870s structure further up the Commons was demolished, the last of the federally-funded urban renewal demolitions. After several years of attempting to find developers for the old Rothschild’s site, two local developers finally managed to cobble together enough funding to build Center Ithaca in 1981. Center Ithaca went bankrupt not long after opening, and Rothschild’s closed up in 1982, so the whole block over there has been pretty underwhelming ever since urban renewal touched it. If anything, the south side of the tuning fork did worse; the potential bank tenant never followed through on its original intent, the city tried for years to sell the property. After several years they finally managed to get rid of the vacant lot. The Trebloc Building was originally planned to have two floors, but financial troubles reduced it to one. The abomination opened in 1974. The Ithaca Commons, which also opened in fall 1974 and was completed the following spring, falls outside of the realm of Urban Renewal as discussed here because it was funded with local bonds, rather than federal monies. The idea of a Commons didn’t start to gain traction until about 1971, after most of the urban renewal projects had left their mark on downtown Ithaca. Like much of downtown, the Commons struggled with high vacancy rates for years, and the mix of stores never quite met the city’s expectations – where the city leaders envisioned department stores and “everyday retail” such as drugstores, neither of those have been historically successful on the Commons, and the use of the Commons as an open-air drug market was an unexpected, unpleasant surprise. It’s really only been in the past 15 years that the Commons has enjoyed low vacancy and strong tenant interest. See, Ithaca’s urban renewal never quite stopped the overall trend of movement to the suburbs. With each decade, development sprawled further and further out, and it still is in parts of Ithaca town and Lansing. For the Jon and Jane Q’s just looking to buy groceries or hit up a fast food place, downtown Ithaca wasn’t on the radar. But there were folks who were still drawn to the charm of a built-up downtown, where emphasis was on two feet rather than four wheels. It was an eclectic bunch – older residents still heavily invested in downtown, and younger, poorer, counter-culture types settling in the area during 1960s and 1970s. Ithaca’s dilapidated downtown, where many retail chains feared to tread, is where a lot of the region’s unique “vibe” sprouted, albeit unintentionally. And, as things go, what’s old is new. There’s a renewed interest in denser, walkable communities, whether for sustainability, cultural amenities, or simply to experience something different from the cul-de-sacs and strip malls that many Gen X’ers and Millenials grew up with. Ithaca, with a stable, growing economy and plenty of fresh blood flowing in and out of the community, was poised to capitalize on this, and his done so with a fair amount of success in recent years, attracting both national retailers and keeping most of its character intact. 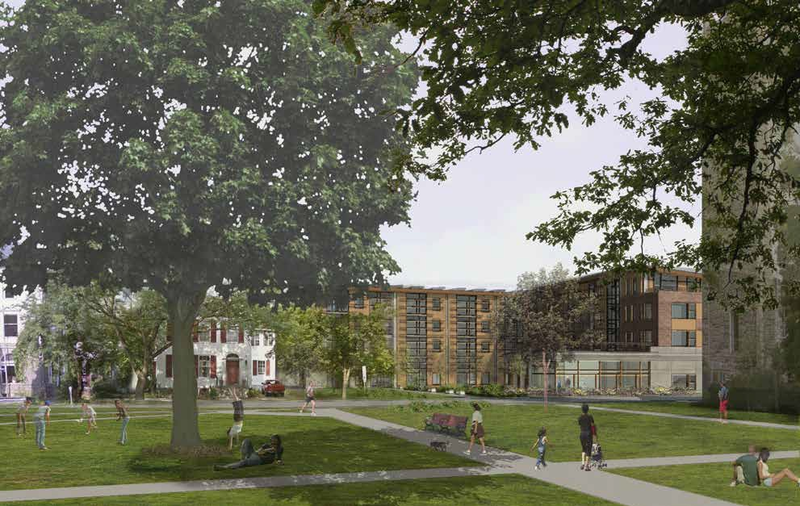 Had it not for the renewed interest in walkable downtowns, newer urban renewal projects such as Cayuga Green would likely have been as unsuccessful as Center Ithaca. The car, once a defining aspect of America’s cultural scene, is now more likely to be treated as an appliance, like a washing machine or microwave. It does what one needs it to do, but the allure isn’t what it used to be. Parking lots used to be eye-catching splashes of color, coral and peach, turquoise and sea green; and now, beige, grey, and subdued reds and blues. The symbolism is there. Urban renewal in the tear-down and pave everything sense was stopped for two reasons – money and opposition. But money was the much more important one. In the later 1960s, funds for urban renewal started to dry up. The city dropped projects two and three and combined elements of the two for a second phase of downtown, and a proposal for Collegetown. The Collegetown proposal was submitted (much to the chagrin of Collegetown landlords), but much of it got lost due to competing interests in the bureaucratic quagmire, and never moved forward under its original intent. The end result was the parking garage, Schwartz Center for the Performing Arts, and the Eddygate mixed-use complex, all of which came to fruition much later in the mid and late 1980s. Meanwhile, residents began to rise up in protest after seeing so many historic buildings demolished in favor of projects that were never built, or were downright ugly. Although too late to save buildings like the Hotel Ithaca and the old City Hall, groups like Historic Ithaca were important in keeping buildings such as the Clinton House and DeWitt Mall from meeting the same fate. It would be unfair to cast those who supported urban renewal as malignant or devious. 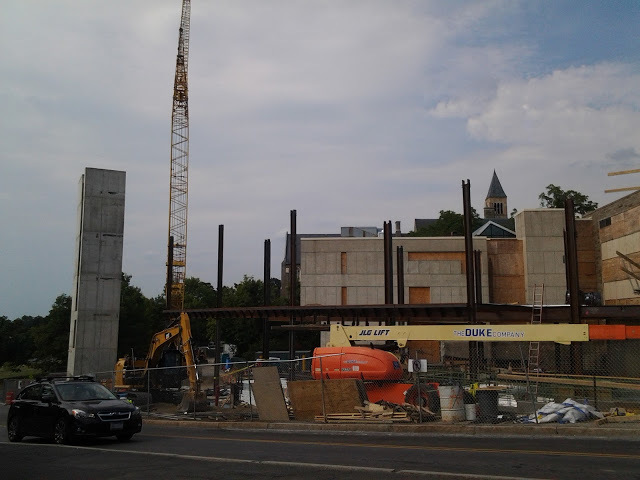 No city official, no mayor, no one with a vested interest in downtown Ithaca set out to wreck it. 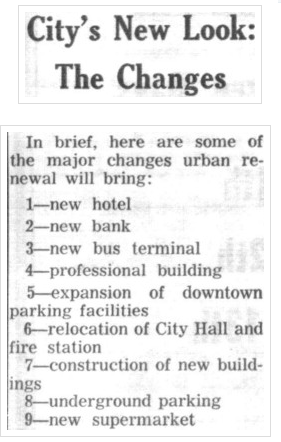 They were trying to revitalize it, and they were listening and applying the auto-centric, “old equals bad” thinking that had been popular in the years leading up to renewal. The results left a lot of hard feelings, and a lot of unmet hopes. 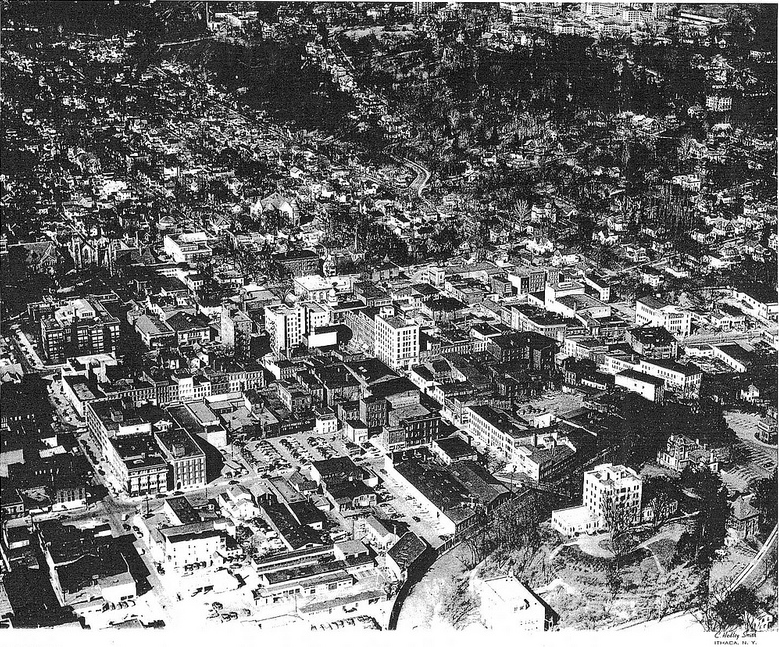 Yet, the issues that faced downtown Ithaca fifty years ago, the problems that the city’s political and business leaders were never quite able to solve, eventually became assets. Old buildings, now loved for character. Walkable streets, now appreciated. Mixed retail, offices and housing, contrary to single-use zoning, now embraced. Ithaca’s old bones, once a persistent ache, have assisted Ithaca in becoming the vibrant city that it is. Buildings and streets can be planned. But the people occupying them? Maybe not so much. Not everything can be planned. And that’s a good thing. It was called “Project One”. The year was 1964. The tax base of Ithaca, and especially downtown Ithaca, had been eroding for over a decade. 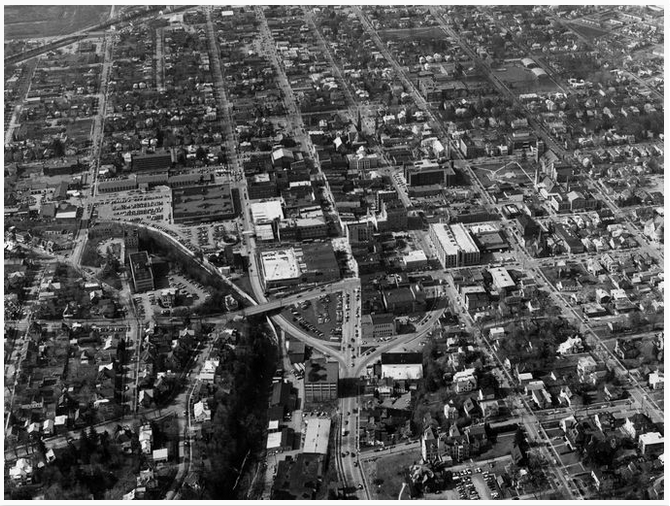 Suburban big-box stores started to appear on the south side of the city in 1950, and up towards Lansing, plans were already underway for a new suburban supermarket and department store (the Shops at Ithaca Mall wouldn’t come along for another twelve years). New neighborhoods were sprouting in northeast Ithaca and Eastern Heights, and cul-de-sacs were paving their way onto West Hill and South Hill. Ithaca College was moving its staff and students to a sprawling campus just beyond the city line. 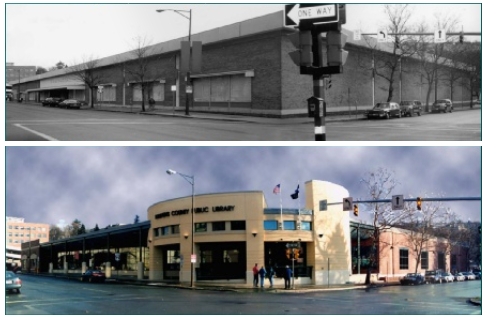 From 1954 to 1960, 48 offices and retail stores closed or moved out of downtown Ithaca, a drop of 18%. The city councilmen were concerned. So how were they to draw people and tax dollars back into the city? The city officials looked around. In the 1950s and 1960s, it was trendy to have that rambling ranch house set back far from the street, it was fashionable to attend indoor shopping centers away from the rain and the cold. But most importantly, the trendsetters agreed, was that one could not live the high life, one couldn’t even dream of being a part of the jet set, without a big, luxurious car at their command. Two tons of chrome and steel, heralding you’ve made it in this world, and your car will take you anywhere and everywhere you want to be. And if a place wasn’t accommodating for your stylish set of wheels, then it wasn’t a place worth visiting. The councilmen and the city officials were taking note of all those chrome-trimmed Bel Airs and Galaxies, with their bright colors and sculpted fenders. Following the results of a study conducted in 1959 and finalized in 1962, they came to the conclusion that in order to revive downtown, they had to catch up with the times, to bring downtown into the mid-20th century future with a swagger and a swing. The plans were grand. In place of the nearly century-old Hotel Ithaca, a new hotel a block long, designed in the finest of modern taste. Out would go the decaying buildings of 60, 80, 100 years yore, in would come wider roads, ample parking, modern buildings and ideally, an influx of cash. Ithaca hoped it would bring new residents back into the city, while Cornell U., happy to give some money towards the effort, hoped it would bring in more industry and research organizations. 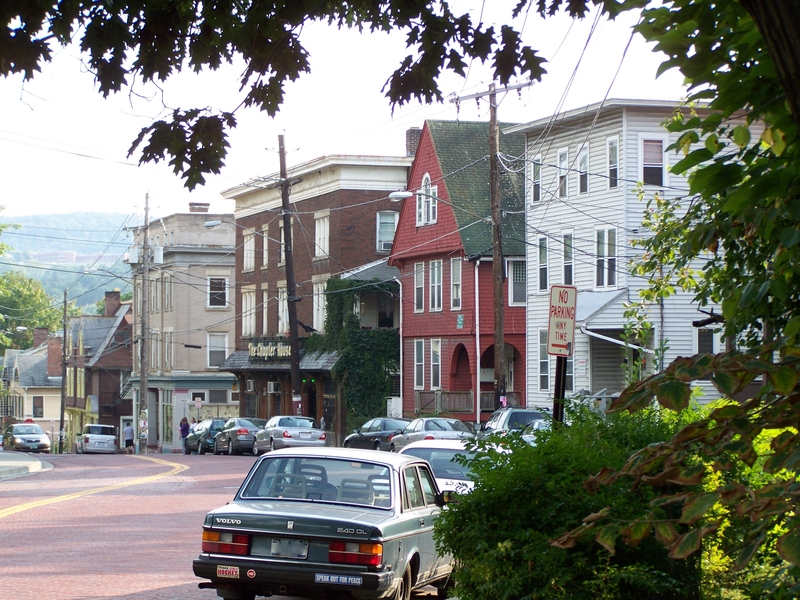 Project One was to be the first of three steps in Ithaca’s Urban Renewal plans. Plans in Project One called for the demolition of the Hotel Ithaca block and the buildings on the south side of the “tuning fork”, already built by that time (and taking out a number of buildings in the process). In their place, the new hotel would go, and a new bank office on the south side of the fork. 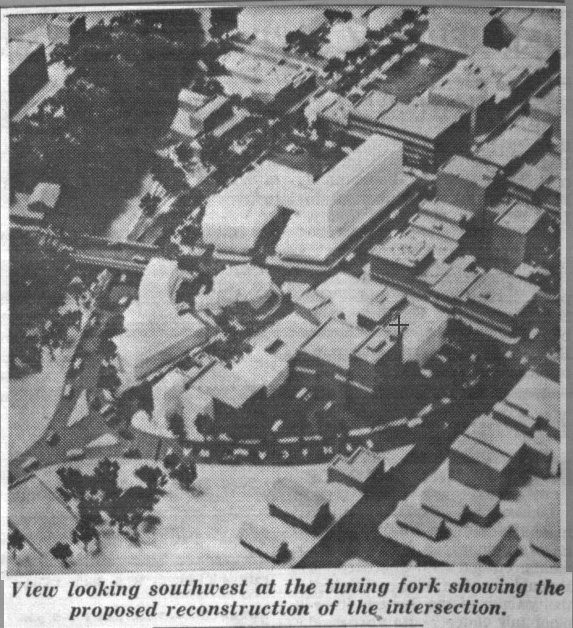 In the model above, you can see what was once the Strand Theater (demo’d 1993), Restaurant Row and the old Rothschild’s Building (also gone now) still intact. There would be new auto dealerships, new department stores, traffic generators and tax generators. Image from Cornell Daily Sun, 10/20/1966. The rest of Project One targeted about 26 acres of land bounded by State Street, Cayuga Street, and Six Mile Creek. Essentially, everything south of the Commons, and everything east of the present Hotel Ithaca/former Holiday Inn. 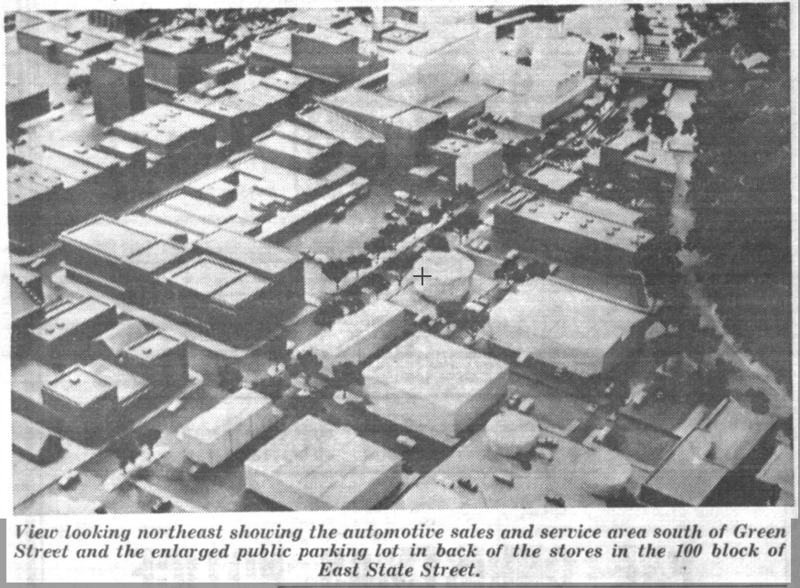 Much of the area between Six Mile Creek and Cayuga Street was auto repair shops, dealerships and other car-oriented enterprises. Pritchard Automotive, a block further south, could be seen as the last vestige of when South Cayuga Street was “Automobile Row”. The plans moved forward in fits and starts. Survey and planning work was brought to a stop in 1962 by Ithaca mayor John Ryan, who vetoed the plan. But following the election of Hunna Johns in 1964, the grand revitalization schemes moved forward again. 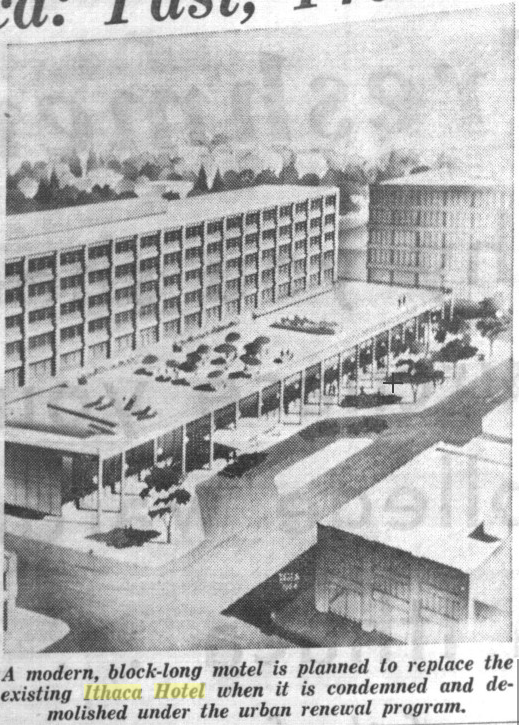 The Common Council approved the federal application for Project One in June 1964. After six months of delays, federal funding came through in December of that year. Cornell had already given funding to the tune of $500,000 (about $3.85 million today) to help pay for the projects, but the federal government would be the primary source of funds, which would pay 75% of the $6 million initial cost. Ithaca and the state of New York would each fund about $750,000. The city reasoned that it would bear the expense now for increased tax revenues in the future. Of course, not everything worked out as planned. Nowhere close, really. That will be covered in Part II. 1. 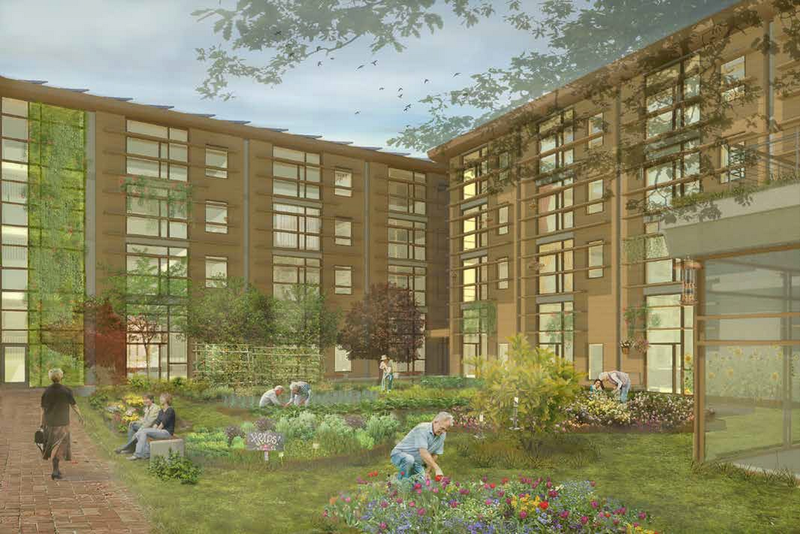 In good news, INHS’s 210 Hancock affordable housing development was granted all the necessary zoning variances from the Board of Zoning Appeals (BZA). The vote was 3-0 in favor; one board member abstained after expressing her distaste for the project. Variances were needed for the height (46.5 feet vs. the 40 feet legally permitted), the parking requirement (84 required, 64 planned) and loading zones for the three commercial spaces, which was granted at the previous BZA meeting. The project now moves on to the Planning Board again for preliminary approval. 210 Hancock also applied for $3.9 million in tax abatements from the Tompkins County IDA, and these were granted at last night’s meeting. According to the application, the tax abatement was requested because the commercial spaces and the pedestrian walkways along Lake Avenue and Adams Street can’t be covered by affordable housing grants. The foundation and high acquisition cost of the former grocery store were also cited as factors in the application. Unfortunately, documents filed with the city indicate that the townhouses will no longer be for sale, they will only be rental units. INHS says that they received updated, detailed construction costs and the result is that it would be “infeasible to build and sell the townhouses affordably“. If there’s any silver lining to that, it’s that all the townhouse units will now be handicapped-accessible, and that they will be built at the same time as the apartment building (no need for subdivision or owner-occupied grant money, which is harder to get). Construction will be May 2016 to July 2017, rather than 2016-2019. “This aspect of the project has many unknowns that still remain to be resolved, so we decided to take a cautious approach with the Planning Board and announce that they will all be rentals. Some of the challenges that we have for for-sale units on this site are: very high land cost; the demo cost for the existing building; uncertainty about the availability of development subsidies; the type and cost of the ownership structure (condo, coop or HOA); the impact of high property taxes on affordability; and the overall development cost in relation to producing a unit at an affordable purchase price. Since then, we’ve reviewed the numbers and reconsidered our earlier decision. We have now firmed up a plan to keep 7 of the 12 units as for-sale units and make 5 of them rental units. All 5 of the rental units will be 3-bedroom homes (the only 3-BRs in the project) and one of them will be fully accessible. The 5 rental units will be clustered at the end nearest to Adams St. The for-sale units will be closer to Hancock St.
2. From townhouses to big houses. 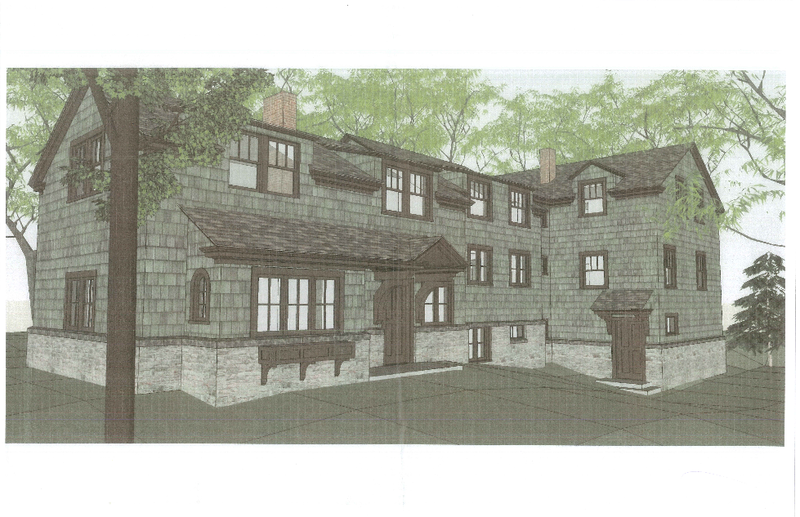 Here’s an attractive proposal for a renovation at 109 Dearborn Place in Cornell Heights. 109 Dearborn is currently a 3,800 SF storage building with an attached apartment unit, and has been since the 1960s; previously it was an office building for the Paleontological Research Institute, and built specifically for PRI in the early 1930s. The building was purchased from Cornell by Dr. J. Lee Ambrose (M.D., so he can get away with using ‘Dr.’ outside of his field without sounding pretentious) for $177k in 2012. Bero Architects of Rochester and Ellis Construction of Lansing are in charge of the design and build respectively. The proposal involves new roofing, dormers, roof extensions, and a gut interior renovation to be done in phases over the next few years. Being in the Cornell Heights Historic District, the project needs Ithaca Landmarks Preservation Commission (ILPC) approval. 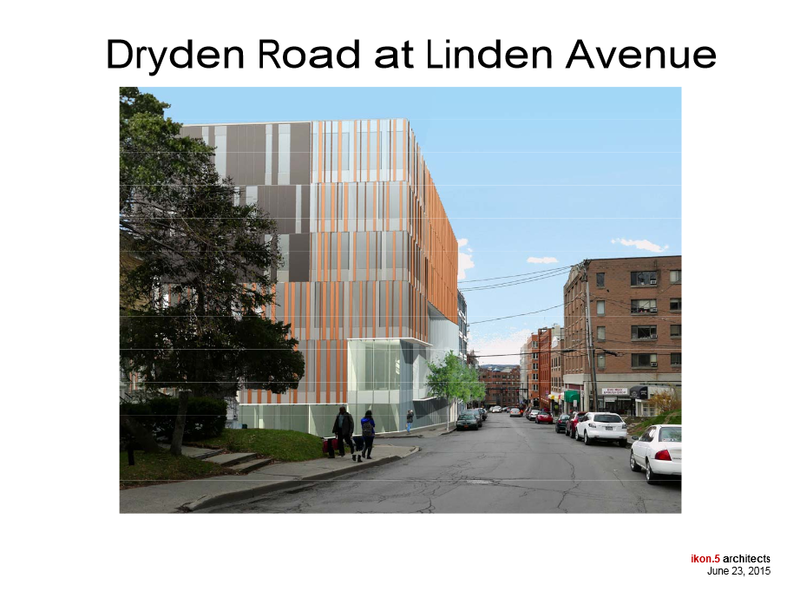 Since the building is considered non-contributing to the historic district (the age is right but being a purpose-built office building isn’t), ILPC may be a little less stringent with this project. 3. Staying on the theme of grand houses, a lakeshore homesite has received a multi-million dollar loan. The property at 1325/1327 Taughannock in Ulysses is right on the lake, and two small houses once on the properties have been demolished. The loan, for $2.25 million, was filed on the 13th, with financing provided by Tompkins Trust. The owner is a senior investment banker from New York with connections to Cornell. In other words, the type of person a lot of Ithacans love to hate. Looking on the bright side, this is an extra couple million for Ulysses’s tax rolls (my anecdotal finding is to tack on about 30% to hard construction costs to get the assessed value, and the hard costs here are $1.87 million…so $2.43 million). Single-family projects of this magnitude in Tompkins County are quite rare, they could be counted on two hands. It’ll definitely be worth a trip to see what this lakeside manse looks like as it moves towards its May 2016 completion. 4. Also in sales, the Carpenter Business Park was purchased by “Carpenter Business Park LLC” for $2.4 million from the lender that repo’d it from the owner earlier this year. Four parcels were purchased – all the land along Northside’s Carpenter Circle except for the community gardens and the building supply company. The LLC is registered to the same P.O. Box as Ithaca’s Miller Mayer law firm, and there’s no indication if there are plans for this site. But you’ll see something here if plans arise. 5. The State Street Triangle public relations campaign begins in earnest – the CEO of Campus Advantage recently submitted an editorial in the Journal, and the Texas-based company has also launched a website, Ithacaliving.com. 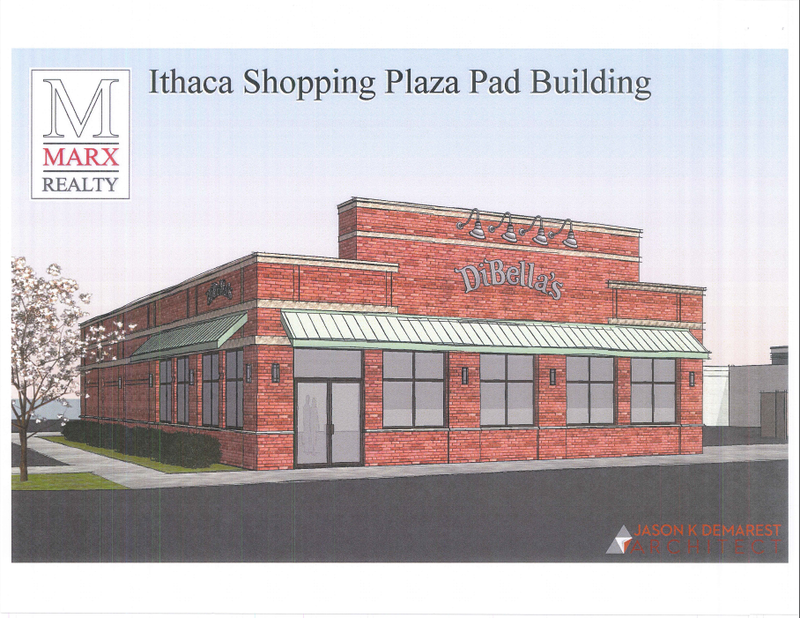 It’s as one would expect, it touts the economic impacts and the addition of housing to the underserved Ithaca market. For those who are more neutral, the site’s worth a look for some new perspective shots, courtesy of the folks at STREAM Collaborative. CA’s effort to assuage the concerns of city officials and the public has been lackluster so far, so we’ll see if this is a sign they’re willing to be more active and engaging. 6. Over in Ithaca town, the State Environmental Quality Review (SEQR) is still underway for College Crossings. 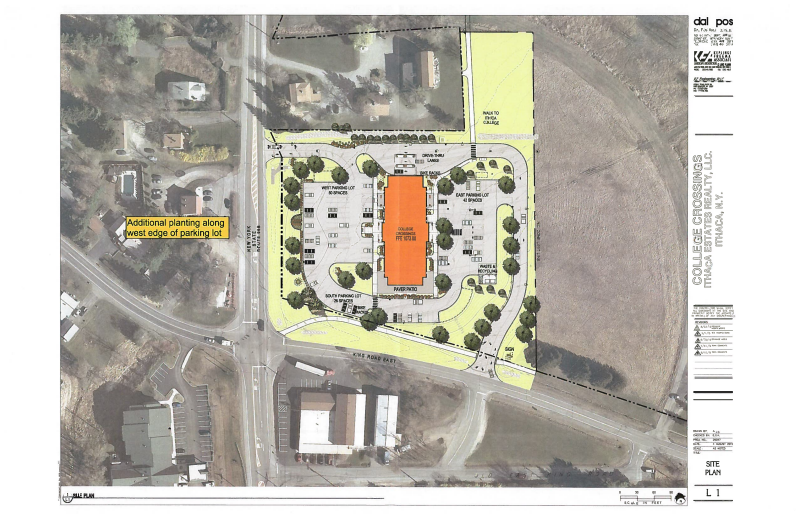 Only this time, the town acknowledges that plopping a building in the middle of a large parking lot doesn’t mesh with their comprehensive plan. 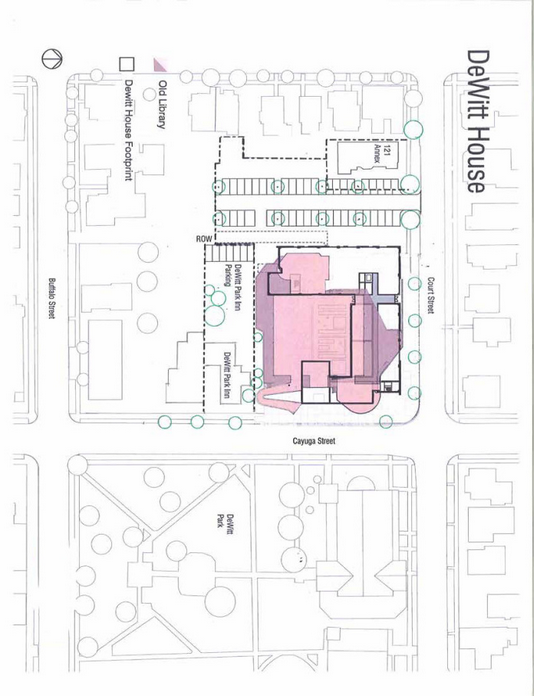 The building is acceptable, but the site plan layout needs work seems to be the gist of the town planner’s review. 7. From the city of Ithaca Planning Board Project Review meeting next week, the phrase of the week will be “carriage house”. 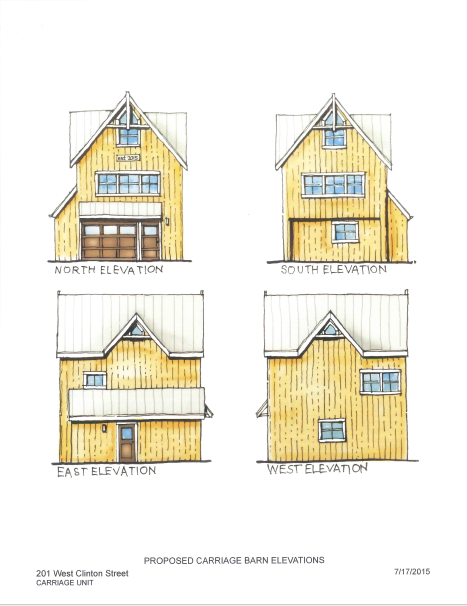 Specifically, two proposals in the city for accessory apartments in the style of carriage houses. Carriage houses were essentially garages for horse-and-buggies. The first proposal, at 201 West Clinton Street, is highly reminiscent of those long-gone days, and it needs to be since it’s in Henry St. John Historic District (more talk about the meticulous restoration of the main house here). The proposal is going up to the planning board for recommendations for a zoning property line setback variance at the next BZA meeting. The 650 SF, 1 bedroom garage/carriage house would replace a non-contributing garage from the 1960s. The architect isn’t stated in the documents. The other proposal is for 607 Utica Street in Fall Creek. The applicant is seeking demolish a rear garage in favor of a one-bedroom, 510 SF unit. In the zoning appeal application (one again for property line setbacks), the homeowner states “My goal has never been to become a landlord…I am hoping to do this only because the income from this would allow me to remain in the community”. Once again, the affordability problem is making itself known. Prolific local architecture firm STREAM Collaborative is responsible for 607 Utica’s “tiny house”. As a matter of opinion, I think these are a great idea. These add to the housing stock, contribute income to homeowner-landlords living only feet away, they’re not obtrusive, and their small size lends well to modest, sustainable living. I hope they go forward.